History can reveal the present as much as the past no matter what the event, nor its staging. The Aviva Stadium will always be Lansdowne Road and there tonight, what may seem like the dawning of a bright new future for Mick McCarthy is, although he at pains to deny it, just the continuation of the past. The persistent echoes of history will reverberate around the plastic bowl. It is 23 years since McCarthy first pitched up here in an Irish dug-out; tonight, he marks his second Dublin debut at the helm. "I loved it the first time around," he tells us, when asked for similarities between this time and the last time. "I can't compare the two." In 1996, he was charged with forging a new way for Irish football on the field; off the field, its administrators were brutally attempting to slaughter a different way forward, too. His debut, a March 27 defeat against Russia - including a red card for Roy Keane, another man whose personality would be coiled tightly around his country's wildly lurching fortunes - was in March 1996, one of many red-letter months for the FAI. Just 19 days earlier - or 18, as nights often merged with mornings in those times - the FAI ruthlessly initiated a purge of high-profile officials. "Merriongate", the catchy newspaper headline that conveniently captured a ticket touting scandal, resulted in a bloodletting that would have made even a Borgia blush. Joe Delaney was the principal victim; his son, John Delaney, then 27, was in the Westbury Hotel that night. Fate, mixed with some foresight, would see the son ensure the family name would rise once more through the FAI ranks even if he never publicly declared that was his sole mission. Regardless, 23 years on from his father's political demise, he is battling to save the family name once more from alleged infamy. Daily, it seems, so much fresh ammunition whizzes in his direction, as steadily accumulating as the siege mentality within Abbotstown which seeks to defy it. Meanwhile, the Irish national side seeks to go about its business. The supreme irony now is that McCarthy, as he was in 1996, is again in charge. Indeed, as he was also, in 2002, when a febrile atmosphere ended his first stint as it had begun, with a home defeat, only this time accompanied by the crowd's catcalls and a manager's private dressing-room tears. Only a year previously, he had led Ireland to a World Cup finals - "the happiest I've ever been," McCarthy enthused yesterday - and it is at times like this when the nation is at its happiest too. "We've come here to play a game," adds McCarthy, whose genius in summoning simplicity in a media auditorium seems at odds with the financial fug emanating from the building less than 100 metres from his seat. "I don't get involved in things I can't affect and this is one of them." And yet he is involved; even if tangentially. But chiefly, his role is to help Irish supporters - indeed the nation - forget. In the past, there had never been an opportunity to block out the despair in how the game was being run in this country for it was so often matched on the field. Euro '88 changed all that; from Stuttgart to Suwon and Palermo to Poznan, the Irish have demonstrated a unique facility to be swept away by success on the pitch. McCarthy knows this history intimately; he was there as a player in the glory days of Jack Charlton when not very many folks were overly concerned at the time with how the FAI conducted its business. That was as true in 2002 as it had been in 1988. And as it is now. History is always repeating. McCarthy has seven games to qualify for Euro 2020, a vast party partly hosted in Dublin, and he desperately wants to be there. So does Delaney. 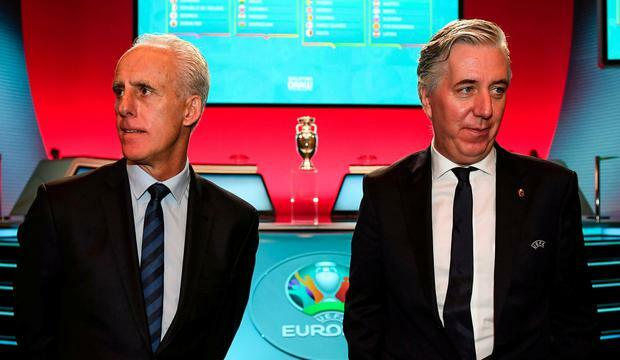 Should he make the finals, McCarthy will bid farewell afterwards; Delaney, who presumably has an eye on a plum role with UEFA, may also be eyeing his exit by then, too. Their roles may differ but their destinies are inextricably linked. "Mick has been the second most successful manager in Irish history," said John Delaney when announcing his re-appointment last year. Without Delaney's support, McCarthy would not have got the gig; now the former Irish captain must repay that faith. He will be handsomely rewarded with a bonus for doing so; we hope there will be no squabbles like there were in 2003 when a row about a McCarthy bonus payment led to an internal putsch against Delaney. But then few will mind once the entire country are literally drinking in the success of a summer tournament.